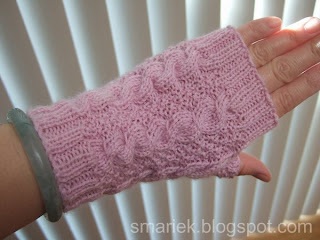 These are the mitts I test knit for Paula, using fingerling weight yarn and 3.0 mm pointy sticks. I was off to a slow start with these since I thought I'd try ML and I also CO too many sts to fit my petite hands. That didn't work out so I eventually reverted back to my pointy sticks. What I ended up doing to make these fit me is to CO 52 sts for the ribbing, increase 3 sts for the pattern, then decrease by 3 for the ribbing. I could have CO 56 for ribbing, decrease 1 for pattern, then increase 1 for ribbing, however I decided a snugger fit for the ribbing section would be better for my hands. In the end they are a perfect fit for my small hands. I don't know what these mitts will be called. The name Paula had originally chosen is already taken, so she is going to rename them to something else soon. You'll find her blog here. Copyright © Smariek Knits 2005-2009. All full copyright rights are reserved by Smariek Knits. I vote for bangles 5 and 6! They are all gorgeous but those are my favorites. I'm so impressed with all of them! Those are so beautiful. Unlike you, I have very large hands, so I've been having quite the time trying to make some that fit me well. Right now I'm doing a pattern where they are flat and I sew them up. That will give me a better idea of fit and then I can do them in the round...I think. Oh gosh...the gloves are GORGEOUS! Thanks for the link to the writer's blog. 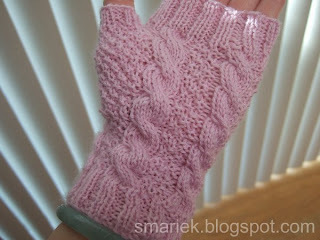 Beautiful mitts! I can't wait for her to post the pattern. Love the mittens. They look really neat with the green dangle bracelet too! My hands are also petite and I will keep that in mind when I try knitting your mitts. I did follow your link and visited Paula's blog. Isn't blogging so much fun!